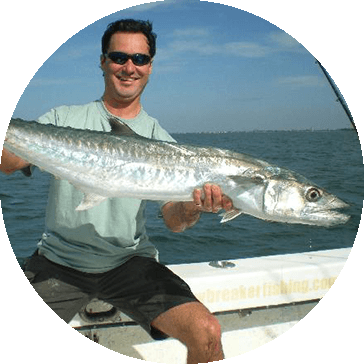 Catching kingfish in South Florida is a YB Normal specialty. Kingfish are found in the waters off of Fort Lauderdale all year around. They are similar in speed to the wahoo. We catch kingfish on 90% of our charters daily. They range in size from small 5 pounders to "smoker kings" weighing over 50 pounds. When "smoker kings" strike, they pull so much line off the reel so fast that it almost makes the line smoke. Just like most of the fish in Fort Lauderdale, there are many ways to catch these prized game fish. We prefer slow trolling with live bait and kite fishing. Kingfish can also be caught trolling and anchoring up on wrecks. Kingfish are found in depths of water ranging from 50 feet to around 300 feet and like to feed on bait around the reef. It is not unusual to catch other game fish such as sailfish, tuna, dolphin, and bonita in these conditions. Kingfish put up a tremendous fight and are great for all types of anglers including seasoned veterans.